As the summer heat waves finally start to break, and the morning air just starts to hint at cooler things to come, manufacturers are hard at work putting the final touches on their lineups for Fall 2017. 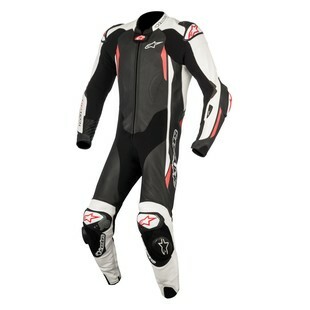 First up so far is Alpinestars, and they are starting off strong with an update to their one-piece race suit line with the Alpinestars GP Plus V2 Race Suit. The GP Plus used to be the third-best race suit in Alpinestars' lineup, just one step below the GP Pro and the GP Tech. Now, with the GP Pro Tech-Air taking that flagship mantel, the GP Plus V2 Race Suit is sliding up into the penultimate spot. The elephant in the room here though is that the GP Plus V2 has not been set up to accept the Tech-Air airbag system, so for that you would have to go up to the GP Pro, or down to the new Missile suit. Besides that though, Alpinestars knows not to mess with a good thing, so the GP Plus V2 carries over all the same features from the outgoing model. There are internal changes to the stitching to continue meeting current CE standards, but the most noticeable change will be the loss of the foam anti-vibration pads on the chest of the suit. We fully expect this V2 version to carry on the precedent set by the GP Plus so far when it comes time to prepare for next year's race season.